Since 1987 our Awards have given public recognition to those who have improved road safety throughout Britain. Now the Prince Michael International Road Safety Awards recognise outstanding achievement and innovation world-wide. Each year the most outstanding examples of international road safety initiatives are given public recognition through the scheme. All road users, including pedestrians, drivers, cyclists, bikers and horse riders are asked to identify those whose initiatives make our roads safer and nominate them for an award. The winners of all the awards will be invited to meet HRH Prince Michael of Kent at a Gala Presentation to be held annually in December. 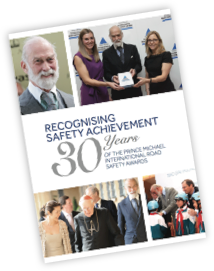 For thirty years HRH Prince Michael of Kent has played a leading role in supporting improved road safety both in the United Kingdom and around the world.